If you recently added events to your meetup group and they are not showing up on your site yet, it's most likely due to your site caching the data and it hasn't refreshed it yet. You can manually fix it by clearing your site cache from the backend of your Joomla site. To prevent it from happening in the future (you'll probably still need to clear the cache first) you can go to the module settings, Advanced Options tab and turn off caching. 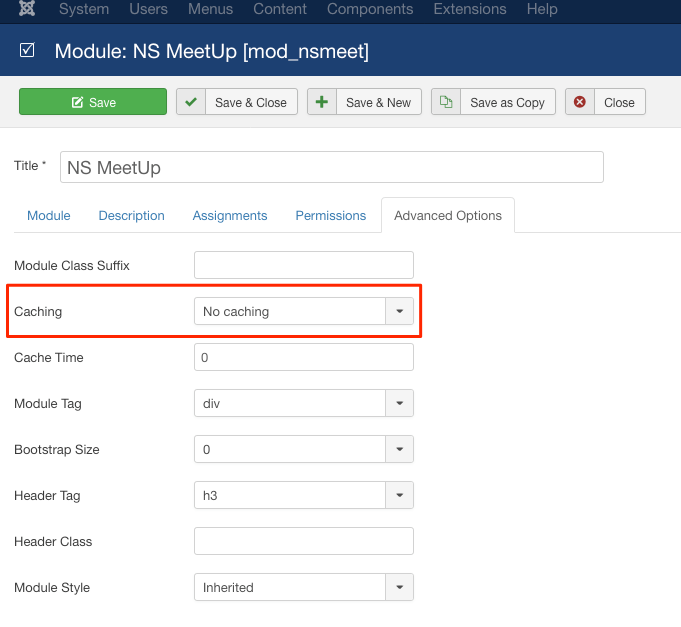 Note sometimes setting caching to no in the module doesn't work due to 3rd party optimization plugins and/or templates that invoke their own caching system. These instances are beyond our control and you'll have to manually clear cache or just wait for it to naturally expire and refresh (that timing all depends on many factors such as Joomla settings and hosting environment).